Some call it (p)insanity. Others are straight up addicted to pinning. And still, there are those who just don’t get it. Pinterest is undeniably the social networking darling of 2012. The site launched in beta-mode in March 2010 and remains an invite-only network. Despite its exclusivity, Pinterest’s user base soared past the 10-million mark in December, and according to Google DoubleClick, now has 21 million worldwide unique visitors per month. But is this site just another blip on the trend-o-meter or something that’s worth your attention? After spending some time with it myself, I found that what makes Pinterest noteworthy is not just what it does, but who uses it and why. To be honest, I hated Pinterest when I first saw it. The site lets you “pin” linked images from the web onto personal pinboards, and follow your friends’ pinboards as well. To me, the homepage looked like a messy collage—I was overwhelmed by the barrage of food, clothes, and chic-looking room photos spread across the screen. 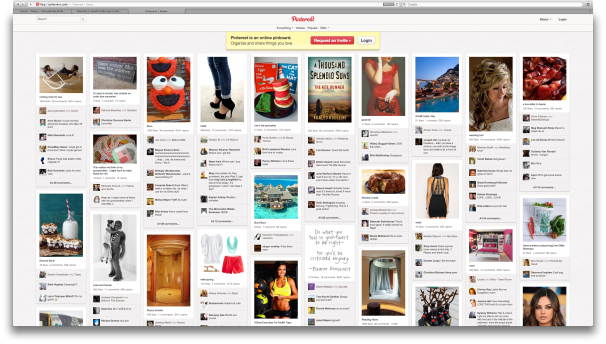 Pinterest's homepage is a medley of photos featuring everything from decorated rooms and food to beauty tips. It's certainly a different look than other social networking sites. But last November I decided to decorate my cubicle and needed a place to collect all of the links of office products I found online. Instead of saving notes and URLs in a a draft email message like I usually do, I decided to create an “Office stuff” board where I could see all of my cubicle toys and tools on a single page. And it was easy to go back, whether on my MacBook or my iOS device, to see where I found the Battleship USB hub or the standing animal calendars. It happened again a few months later. I got a color consultation as a holiday gift and wanted to look for clothes that matched my color palette. (I’m a Vital Spring, by the way.) I logged back into Pinterest to start pinning clothing. Pinterest drew me in when I was in the mood to hunt the Internet for stuff and collect all of my finds visually. Since the site is inherently social—you can repin, like, and comment on pins—my followers and even random Pinterest users would interact with what I posted. And yes, it does feel good when this happens. Besides collecting my finds, I liked that it was so easy to give and receive feedback on the site. Just remember to be nice (Pinterest’s number #1 rule). Who is and isn’t pinning? 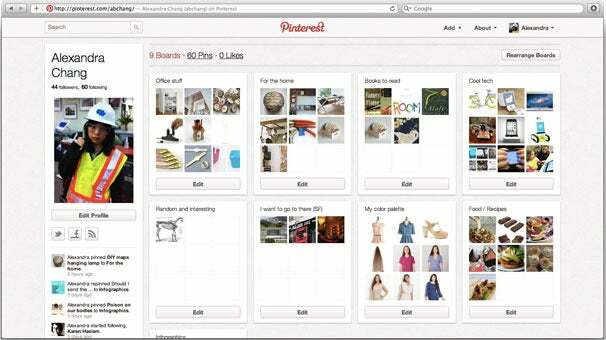 The vast majority of people on Pinterest are women—females make up 82 percent of U.S. users. But outside of the United States, Pinterest users are often mostly male—they make up 57 percent in the United Kingdom, 79 percent in Japan, and 74 percent in France. (Data from Google AdPlanner.) What’s most notable about Pinterest’s audience is that they aren’t the typical early adopters of technology—for example, Google+ is dominated by tech industry folks and engineers; two-thirds of its users are male. Still, the usual early adopters—tech journalists, for instance, are going wild writing about Pinterest. The New York Times covered Pinterest two weeks ago. Columnist David Pogue hasn’t pinned anything since. The Atlantic’s Alexis Madrigal wrote two pieces on Pinterest, but his recent Pinterest activity is limited to the two days his articles went up. The same goes for a lot of tech journalists. Unlike Twitter or Facebook, Pinterest is not the social media solution to news broadcasting. Its users are doing something else entirely. But what? “A lot of what gets pinned on Pinterest is aspirational—what could be, what I’m going to have, where I’m going to go,” said Gartner senior research analyst Jenny Sussin. What sets Pinterest apart from other social networks is that it isn’t about sharing what’s happening to you right now, it’s about sharing and collecting what you like and what you want and what inspires you. Some of bloggers I talked with who use Pinterest say they depend on it as a personal tool rather than a social one. “I am always saving images for inspiration, future post ideas, and projects, so I use Pinterest every day,” said Joy Cho of Oh Joy. “It’s just fun looking at a beautiful page of images that make me happy and inspire my work.” Visual bookmarking isn’t a totally new idea—sites like Ffffound have offered similar features. Pinterest just does it better. As a personal tool, Pinterest lets you collect links visually so you can compare objects side by side, or just keep them for inspiration. The site can also inspire discovery, depending on your interests. You absolutely will see a lot of women’s clothing, decorated rooms, and desserts, especially on the Popular page. I’ve heard complaints from friends who say they don’t like Pinterest because they don’t want to look at pictures of purses and shoes and other consumer products. But that’s not only what the site has to offer. Type infographic into the Search tool and you’ll find an endless, and attractive, display of infographics on everything from Twitter to health care. You can also find compelling art on Pinterest (which will hopefully take you to the original artist’s site). I especially like searching for collages on the site. Pinterest isn't just about clothes and cupcakes, anything visual will find a home here. For instance, this is a selection of infographics. “If you want your image to be viral, take advantage of the space you’re in,” Sussin said. “You’re not going to be successful unless you obey the rules of the location you’re at.” That means not just posting images of your logo, but images of stuff that would appeal to a Pinterest user. Finally, Pinterest can also be a powerful resource for learning about what people are interested in. “Pinterest is a continuation of our efforts to be where our readers are. Seeing what users like to share shows us what kind of content they’re interest in—and that’s invaluable to us,” said Allie Townsend, Time Magazine’s social media editor. Not all businesses will actually find their audience here. While some, like high-end grocery store Whole Foods Market or fashion-oriented refinery29, have gotten a following of 17,533 and 16,714 followers respectively, a bank or financial institution that doesn’t have much visual content probably won’t be able to do the same. If you have a retail business, Pinterest might prove a great way to connect with customers and point them back to your site. Will Pinterest outlast its moment of media fame? My best guess is yes. It definitely has a few kinks to figure out, from its revenue source to copyright issues. But you can’t deny that the site has gained a lot of very loyal and very active users. Pinterest doesn’t feel like any other social network, mainly because users are posting more for themselves than for others. (Personally, I get tired of the “broadcasting” that happens on other social networks.) And as the site grows to include more users, and presumably a more diverse crowd, it will come to better define itself, too.